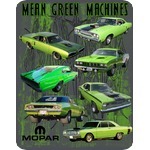 MOPAR of Mean Green Machines on a new extra large light green tee shirt. A series of cars on this front print only. It is a licensed print to Dave Carey tees.